Melco are not a new company in the hi-fi marketplace – far from it. If you have been into hi-fi for a long time you may recall the classic Melco turntable from around 1980, which was a bit special in its day. From those early beginnings in the 1970’s Melco evolved into one of the largest suppliers of computer peripherals, manufacturing NAS drives and networking equipment. Fast forward several decades and and they decided to revive the highly regarded Melco brand, offering discerning audiophiles high technology networked audio components in the spirit of those much revered early Melco products, while incorporating the very latest research into reliable high performance networked devices and storage. Audiophiles the world over are familiar with the well-used phrase “garbage in-garbage out” and that the source component is the most critical in any hi-fi system. The best amplifier and speakers in the world are rendered useless if the source component is unable to reproduce music to a high standard. Over 30 years after it was launched, the CD as a format is as strong ever, although it has taken many years for the best performance to be extracted from the disc. However, there were always limitations with the CD, largely in the amount of data it could store. With the introduction of high resolution digital downloads we can now overcome this limitation of the CD and can access music files exactly as the artists and mixing engineers intended. Unfortunately, the concept of a serious streaming/storage source component has been lost, with many hi-fi users storing their beloved music collections on your typical IT based NAS drive solutions, which are fine from a storage point of view but are flawed with regard to obtaining the maximum performance out of your ripped CD collection or your downloaded “Hi-Res” files. This is where Melco came into the fold. They decided to manufacture the world’s first genuine High Definition Digital Music Source, with none of the compromise of traditional computer peripherals. With a high end source component to store and deliver music, Melco offers the music lover the opportunity to enjoy greater than CD quality playback without compromise for the first time. The N1A/2 and the N1ZH/2 both have 6 terabytes of storage, whilst the N1ZS has 2 terabytes of audio grade SSD storage. The N100 has a single 2 terabyte drive and the N10 has a single 3 terabyte drive. The internal storage can be configured (very easily) so with the N1A/2 and N1ZH/2 you can have 3 terabytes of usable storage with the 3 terabytes utilised as a mirror image. With this configuration, in the rare event of a drive failing – you lose no music, which is good! However, this is not a true back up of your music. If you accidentally delete an album you will be removing it from both drives! For the cost of a decent sized external USB hard drive it’s not really worth worrying about! Back up properly! With the N1ZS/2, N10 and N100 you have a single hard drive so an external back up is essential! With the N1A/2 and the N1ZH/2 the other option is to configure the onboard storage so there no internal back up so you have 6 terabytes of usable hard drive on the N1A/2 and N1ZH/2 and 2 terabytes on the N1ZS/2. Like the single drive models – back up! The other option is to configure the onboard storage so there no internal back up so you have 6 terabytes of usable hard drive on the N1A/2 and N1ZH/2 and 2 terabytes on the N1ZS/2. I must stress this is only recommended if you have a USB hard drive connected to the dedicated back up socket on the Melco. Believe it or not, there is a performance gain to be had by doing this; however, you must use the back up facility if you intend to use the machine this way. If either one of the drives fails you will lose all of the music. Backing up is quick and easy, you simply leave the USB drive connected and run a back up every time you add new music. Nice and simple and you get a boost in sound quality for free! For the performance gain, going for a RAID 0 configuration is well worth it on the models that offer it. I quite often speak to people about ‘computer’ audio and streaming in general and in certain circles there seems to be a bit of negativity and reluctance as people incorrectly presume it’s complicated and it doesn’t sound very good because it’s compressed or people don’t like using their computer with their hi-fi. Here’s a few salient points regarding the Melco models. Simple set-up from front panel OLED display. Specific DSM IP port for Ethernet Streamer/Player with separate LAN port for Control and network. 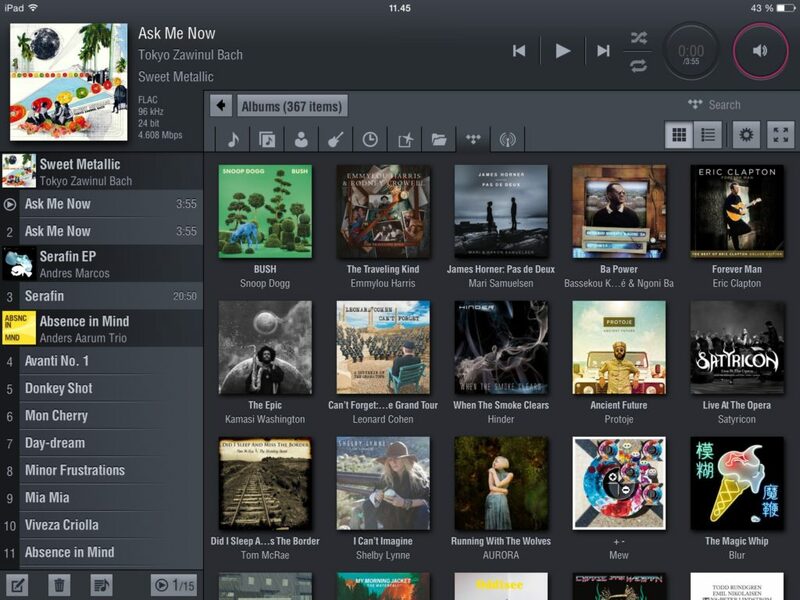 Automatically creates very simple robust network for streaming high resolution music and control. Simple power operation, normal ON/OFF switch. Just 5 seconds to power down and 15 seconds to be ready from switch on. Informative OLED display with just 4 navigation buttons, displays all relevant settings, connected devices, capacity, setup, format and current song playing. 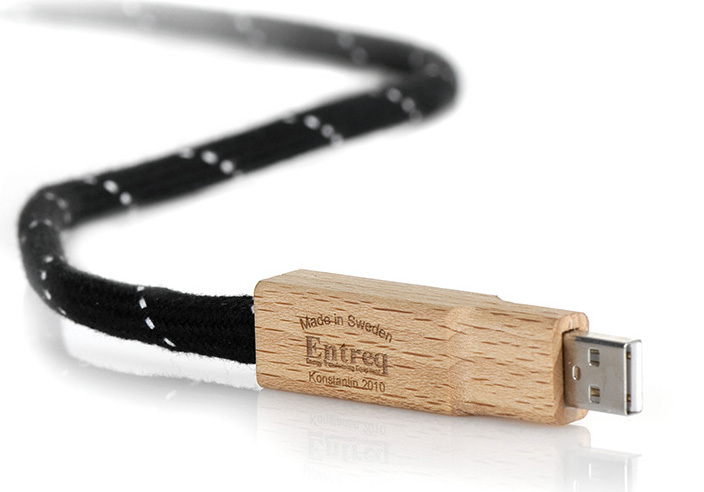 Simple Backup – music is secure with a USB connected Backup in a single button press. 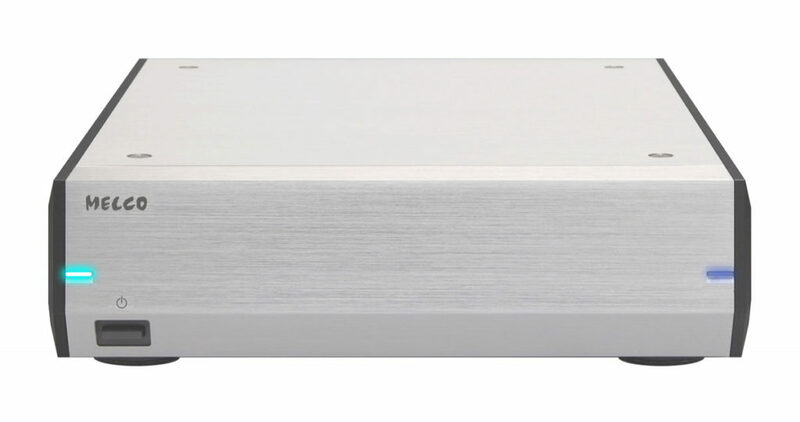 Simple Expansion – when the music collection outgrows the internal storage capacity a USB drive connected to the Melco will extend capacity without any setup being needed. Simple music import from USB drive in just one button press. Simple music download from High Resolution vendors direct to Melco without the need for a Computer. You simply connect an external CD ripper to the USB3 socket on the rear of the Melco, insert a disc, a couple of button pushes on the front panel and the CD will be ripping, bit-perfect, in either uncompressed FLAC or WAV (with perfect meta-data including artwork). When the CD rip has completed, the disc automatically ejects so you can load the next one. Nice and simple. I must stress though, that not all external CD rippers are created equally. You can plug any old external USB CD ripper to the Melco and get a pretty good result, but when used with a better drive the quality of the rip carried out by the Melco is second to none. Once you’ve completed your collection you can breathe easy again. Also, when you insert a disc the menu actually asks you if you want to import the disc or play it. 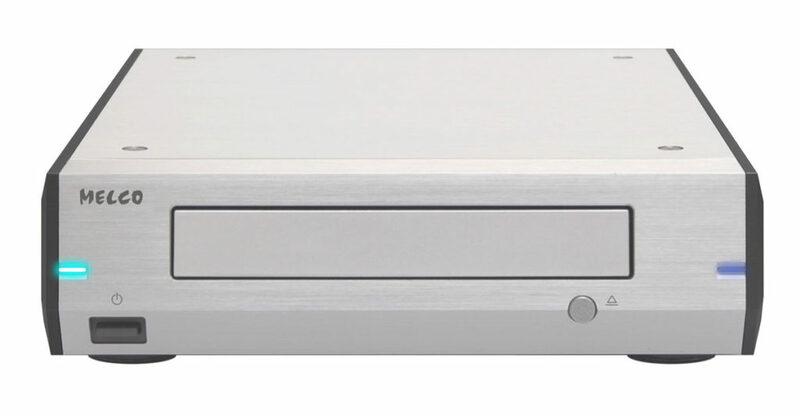 If your Melco is connected to a USB DAC you can also use the CD drive as a CD transport if you ever want to a spin a disc. In the spring of 2018 Melco announced the launch of their own dedicated CD ripper – the D100. We are patiently awaiting the arrival of our demonstration unit. Weighing in at 3.5kg this is an extremely well built, heavily customised design – using a proprietary Melco circuit board it hold capacitors for the power supply and uses a high quality clock generator. On the face of it using this to rip discs shouldn’t result in better performance compared to using a standard ripper (like the ones on their recommended list), but all initial testing and listening is proving otherwise, for both CD ripping and CD playback. Once the D100 has arrived it will be thoroughly put through its paces and we’ll report back with an in-depth article. I don’t want to but I am expecting to have to rip my collection again unfortunately! The D100 can also be used to rip CD’s directly to a computer – so if you don’t own a Melco player but have something like a Linn or Naim network player and a conventional NAS you can use the D100 to rip your collection ensuring you get the very best rip possible! The E100 is an audiophile 3TB expansion drive. The reason behind this is quite simple. All of the Melco models have a USB expansion port, so should you fill the internal storage up you can easily expand it by connecting a hard drive to the expansion port. Unfortunately, there was a downside to using any old USB drive – it never sounded as good as music stored on the Melco itself. The E100 was designed from the ground up as a solution to this issue. The drive is a carefully selected 3TB hard drive, this drive is physically supported internally using the MELCO Highly Stable Storage System (HS-S2), the same as found in the N1ZS/2A. It uses the same high quality case as the D100 using a 2mm thick aluminium under chassis and weighs in at a healthy 3.6kg. If you look at the rear connections you will see a USB socket labelled ‘back up’. Get yourself a USB drive to match the size of the Melco (either 2 or 6 TB depending on which model), plug it in to the back up socket and let it do its thing. The first time you run a back up it will take a while, but subsequent back ups are incremental and don’t take long at all, providing you initially format the USB drive on the Melco and not your computer. An external back up is worth doing even if you have set your Melco up in RAID 1 mode. You can’t be too paranoid about looking after your music collection in my opinion!!! As mentioned above RAID 0 does offer greater performance (this is not a subtle difference either), but using Backup is essential for RAID 0 installations. There is also a socket on the rear panel labelled ‘expansion’, if you end up filling the internal drives, you can plug another USB drive into this socket and expand upon the internal storage……neat! There are quite a few websites where you can purchase and download 24 bit Hi-Res music; this link has a decent directory of the various sites. Typically you browse online, find something you want to buy, download it to your computer and then copy and paste to your NAS drive; eventually you can play your download! Melco have gone one better. 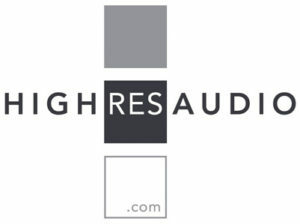 They have teamed up with the German company High Res Audio. Simply visit the site and set up an account (which is free, no subscription needed). On the front panel of your Melco enter your email address and password from High Res Audio and any purchases you make from them are downloaded automatically onto the Melco – no messy files transfers needed, it’s all automated. High-Res Audio even looks at the quality of the download and if it feels it isn’t up to the job it will reject it and start again, all without you knowing. It’s a slick process and works incredibly well. Technophiles love it because it’s cool. 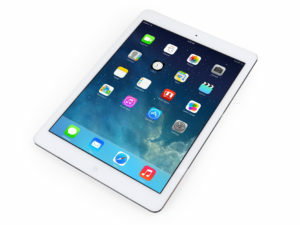 Technophobes love it because it’s simple and easy. If you have a sensible internet connection it takes about 10 to 15 minutes from purchase to playback. Please note: If there is a piece of 24 bit music you want to purchase from another download site you can do it in the traditional way – download it to your computer and then drag/drop into the Melco via your computer, it’s just a little more labour intensive! There are two ways a Melco can be integrated into a hi-fi system. 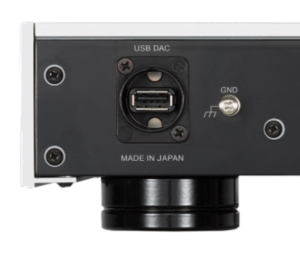 The most popular way is via USB; the latest generation of Melco models all feature a dedicated socket for connecting to a USB DAC as shown below. This is always my preferred way to way to hook up a Melco from a performance point of view. In terms of which DAC, there are lots of options available depending on budget and what level of performance you are looking to achieve. Take the Exogal Comet for example; this DAC combined with a Melco makes for a formidable source component, one which I would quite confidently put up against other things costing a lot more money. 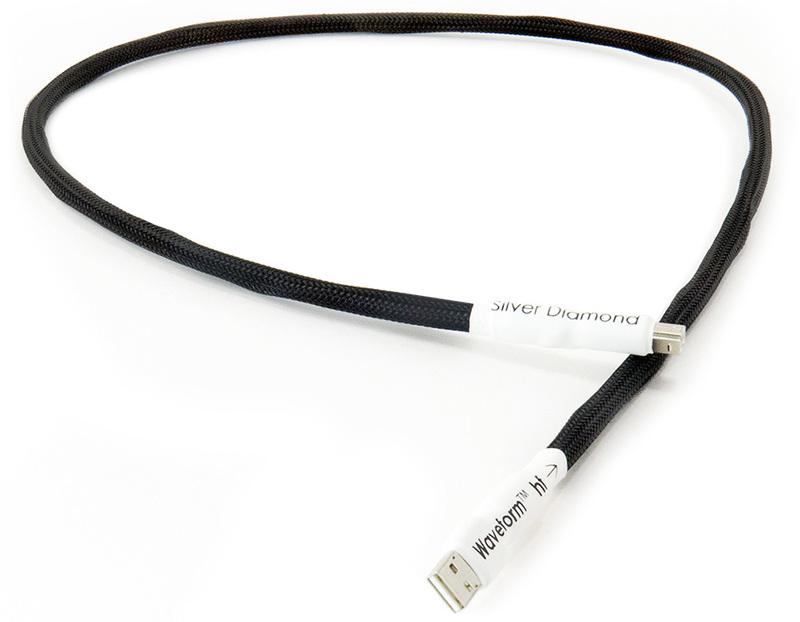 You will also require a good USB cable as well; please don’t overlook this as it does make a quite a difference to performance. Entreq & Tellurium Q are the 2 brands I work with and you can get excellent but different results from using them. The Melco website has a compatability list showing tested DAC’s, but don’t worry if your’s isn’t listed, the list isn’t exhaustive. I don’t think I’ve ever come across something that doesn’t work, although some older designs may only play limited sample rates which is a restriction on the older DAC design. Perfect excuse to buy a new one! The other way to connect a Melco into your Hi-Fi is via the Ethernet socket. 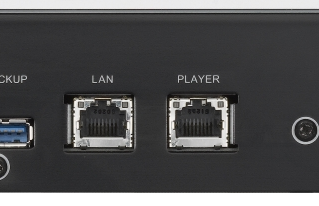 You may have noticed looking at the rear panel, that both Melco offers 2 Ethernet sockets, one labelled LAN, the other Player. The method is ideal if you already have a dedicated Network Streamer, like a Naim, Linn or Cyrus. The Melco connects to your router/network via the LAN port and your Streamer plugs into the Player port. By doing this you are in effect isolating your streamer from any noise/interference which will be present on your network, improving sound quality. Your streamer will still be connected to the Internet for updates and Internet Radio though and will still be controlled via the same app you have always used. What file formats can it play? If you are using your Melco in conjunction with a dedicated UPnP Streamer (like a Naim or Linn) you simply use the appropriate brands app to playback your music as you always have done; nothing changes from that point of view. However, if you are using your Melco with a USB DAC (this is by and far and away the most popular way to use a Melco), you will need to use a third party app in order to select what music you want to listen to. There are plenty of excellent apps available from brands such as Bubble UPnP, Lumin, Linn, Cyrus, Lumin, and Arcam to name but a few. They are all slightly different in the way they look and perform, so I would always recommend having a play with a few different ones and see what works for you. Linn Kazoo and Lumin are both excellent apps and available for Android and iOS devices. If you are anti-apple and use Android, Bubble UPnP is excellent as well. All you require is a monthly subscription to one of the 2 services and you are good to go. Linn Kazoo and Lumin and are the two apps that offer Tidal and Qobuz control, both are very good, but I much prefer Linn Kazoo speaking personally. Performance of both services is excellent with their CD quality subscription. Sonically Qobuz is superior in my opinion, on a good system it is quite a bit better. Performance – How do they sound? Make no mistake, all 3 Melco models are superb and they all have their place in the right system. The N1A/2 is a serious source component and when combined with a good DAC it genuinely makes for a really compelling front end for any system. I’ve never done a demonstration where someone has not been impressed by the sonic performance on offer. I’ve used this model with DAC’s and streamers from Exogal, Auralic, dCS, Arcam, Naim, Devialet and Linn and the performance is consummate with whatever you plug it into; the better the DAC the better the end result in most cases, but please don’t think that if you have an older inexpensive DAC you won’t get great results. I managed to have a listen to the original N1A and the new N1A/2 side by side and there’s quite a gulf in performance. The newer model is certainly more transparent and revealing. Moving up to the N1ZH/2, the improvements they have made with this over and above the N1A/2 shows within about 20 seconds of pressing play. It does all of the things the N1A/2 does, it just does more of them and does it better. The increased sense of scale, lots more weight to the presentation and the soundstage just got wider, deeper. The reproduction of timbres is more accurate, instruments start to sound more real, more alive. Tracks where you think there were 2 musicians playing, suddenly uncover a third you’ve never heard before. The lower noise floor results in less distortion which in turn lets you hear more of the finer nuances in the recording and you can really get lost in the music. If you have a great DAC the benefits of the N1ZH/2 over the N1A/2 are pretty obvious once you start listening. The music simply flows and pulls you in, it’s a seductive and addictive experience! I have had quite a few customers upgrade from N1A mk1 to N1ZH mk2 and every single one of them has been delighted with the performance boost. Moving up to the N1ZS/2 the price jumps up from £4750.00 to £8750x.00 and you get 4 terabytes less storage, so we’re not off to a good start! Then you play some music! The improvements Melco have engineered with the N1ZS/2 are pretty obvious right from the off. Improved clarity, more focus and cohesion. There is more bass and I mean that in a good way, it’s tight and controlled but it goes lower than the other 2 models. If you have a relatively inexpensive DAC/system the N1A is the obvious choice, comparing the N1A/2 to an N1ZH/2 with a DAC costing upwards of £2000 you can pretty much instantly hear the improvements the H has to offer. Likewise with the S, if you have a serious system the benefits that the flagship model offers is audible from the off. Once you have heard an N1ZS/2 there is no going back unfortunately. Don’t underestimate what all of the Melco models are capable of delivering at their respective price points and please don’t fall into the trap of thinking the Melco is simply a NAS drive or Computer in a hi-fi shaped box. 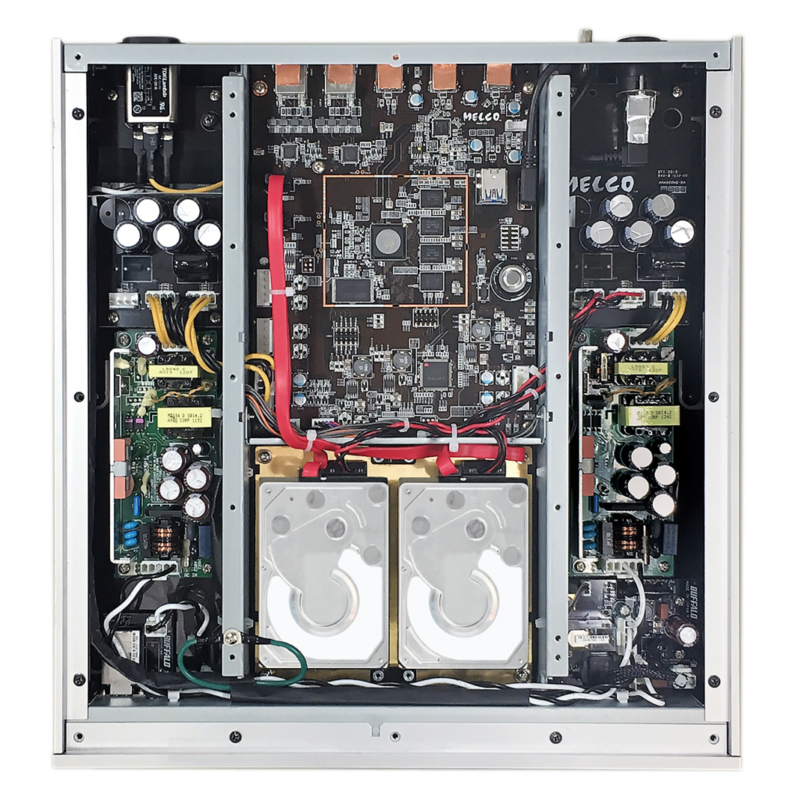 Melco uses no off the shelf computer components in any of their products.